The other day, a Reddit sub about ‘Barska scope reviews’ turned into a heated argument between pro-Barska guys like me and purists who wouldn’t think beyond a Leopold. To put things in perspective, I am as American as apple pie. And I love US made stuff. But that does not mean that I’d trash anything that is not made back home. Having used Barska scopes for over a decade now, I can vouch for the fact that their scopes are reliable, well built and cost half of what you’d otherwise spend for a decent set of glass. I have taken my Barska for deer hunting, blown the head off varmints and even hit an intruder from 300 yards with pinpoint precision. True, it can’t probably rival a scope costing a few times more from other brands. But if you are on a budget and looking for something decent that does the job, you will like the scopes from Barska. They might not be the best for long range shooting, but unless you are looking to bring down targets 1000 yards away, Barska has an ensemble range of scopes that can fit your budget and cater to your shooting needs. Coming back to the Reddit sub, it was that discussion which spurred me to create a list of the best Barska scopes that are being sold online. Consider this as one of the best and most underrated rifle scope brands in the market. If you have been misguided by some of the ‘biased’ Barska scope reviews that have flooded the internet, then this will hopefully give you enough information to learn more about these versatile scopes. Despite being one of the most widely used semi-automatic guns in America, there are hardly any reliable scopes for the AR-15 that are reasonably priced. So when Barska launched the 4×32 IR based scope with a very attractive price tag, it immediately grabbed my attention. A week later, it was firmly mounted on my AR-15 and ready to be baptized. First I headed out to the range and fired about 200 rounds just to get a hang of the usage. The next test was more difficult. There were a few prairie dogs out about 300 yards or so. Hit the critters every single time. Last was plinking cans at short range. Once again, flawless! I even dropped the rifle a couple of times in addition to knocks and bumps that it took while driving. The scope stayed true and wouldn’t budge. The 4×32 IR has a bunch of practical features that are designed for versatile shooting applications. It is built from aluminum alloy, weighs a tad over 10 ounces and has a 1-inch tube diameter. The anodized matte finish deters scratches and is well suited for tactical applications as well. The tube is Nitrogen-filled for use in foggy weather and provides a generous 3.3 inches eye relief. Also thrown in is a sunshade for use in extremely bright and sunny weather. I have seen many budget-priced scopes where the illumination is a hit or miss. But the Barska 4×32 is one of the better ones out there. It provides both, a green and a red illuminated mil-dot reticle that can be swapped using an intuitively positioned side turret. The red reticle is more suited for low light situations while the green one is perfect for brighter shooting conditions. More importantly, you can adjust the brightness too. I would make an excellent 30-30 scope. There is a general misconception that a good quality hunting scope doesn’t come cheap. I hate using the word cheap because people tend to associate it with ineffective. Inexpensive sounds better. This is Barska’s best inexpensive offering for hunting. It boasts of variable magnification, a 28 mm objective lens and an illuminated reticle packed into an extremely durable body. If you are hunting deer or other varmints, then you’d appreciate the accuracy that this scope has at mid-range distances (300-400 yards). At the same time, at 1x, you can use it with the iron sights on your rifle for extremely close range shooting. At the price point, the Barska 1-4×28 gets pitted against some serious competition. So, Barska doesn’t leave any stone unturned here. The optical quality is top notch. The lenses are multicoated and the images look sharp and clear in all kinds of weather. Oh, it is CO-2 nitrogen purged and O-ring sealed by the way. So, you can take it out in rain or cold without the glass getting fogged. Barska’s signature illuminated reticle is retained in this and on a low-light foggy day, it really shines. If you prefer not to use the illumination, it has a black fine crosshair that works equally well. 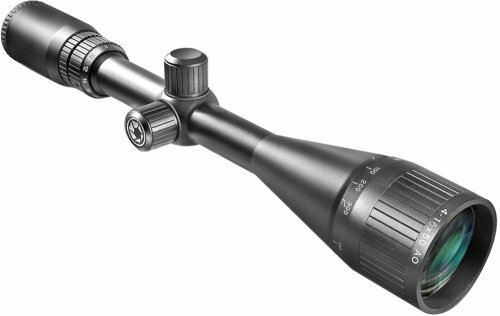 At 16 oz, the Barska 1-4×28 hunting scope is not exactly lightweight. But I’d take a heavy but durably constructed scope over a lightweight but flimsy one any day. This is built like a tank. Just use the external target turrets to lock the windage and elevation and fire away. it Also has an eye relief of 4.4 inches. If your target zone is at the highest magnification point, then you will love the generous eye relief. When you look at the price you may think that this scope just won’t do the job, but this may not be true. This is an extremely good quality glass at its price point. Only Simmons has offers that can rival it. If you are on a budget it’s an excellent scope for .22 caliber rifles. The Barska Plinker-22 weighs a feeble 11.05oz. But don’t let that fool you into thinking that they have cut corners. It boasts a 1-inch monotube construction that is sealed and weatherproof. The scope feels durable enough to take out to the woods and tides through the drill while shooting cans. Doesn’t budge from the rails and holds zero. Barska also throws in a few extras in the form of a 3/8 inch mounting ring, a lens cover, and a cleaning cloth. I did not like the rings too much. But that’s only a minor quibble. 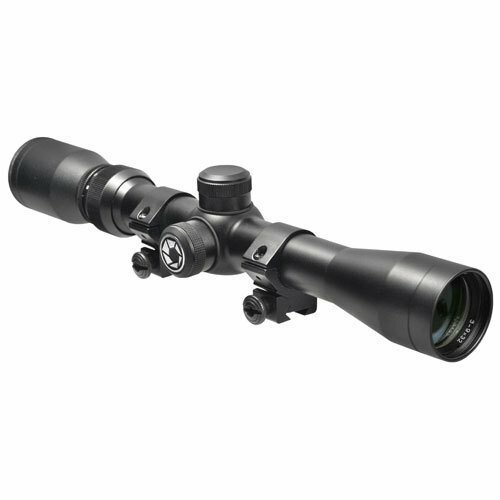 The Barska 3-9x 32 scope zeroes in at 50 yards and holds zero through the magnification range easily. It features finger adjustable turrets at 0.25-inch click increments and uses a duplex reticle. Barska calls it 30/30 in the literature that accompanies the scope. It works perfectly for short range shooting. By the way, the scope is parallax free at 50 yards and Barska claims almost 95% accuracy at 100 yards. Probably the best plinking scope for the money. If you are a fan of traditional rifles, you may find best muzzleloader scopes interesting. Anyone who has shot critters at his property will know that it is a tricky affair because there is no rule of thumb when it comes to an appropriate shooting range. In my farm in Missouri, it is usually in the 100-150 yard range. But I have also helped my cousin knock down some coyotes that were sneaking into the chicken coup at about 300 yards in a heavily wooded surrounding. The Barska 6.5-20×50 is a favorite of many. Very reasonably priced, this all-weather scope offers variable magnification, is as precise as it gets and shows crisp and bright images. The first thing that you’d notice when you take the Barska Varmint scope out of the box is how heavy it is. It weighs 22.05 oz. But for varmint shooting, that does little to limit the effectiveness of the scope. If I’d be hiking with the rifle slung over my shoulder, I’d probably look for a lightweight option. In this case, though, it feels like a very well constructed and durable scope. It is water and fog resistant and has finger adjustable turrets for both windage and elevation which are mounted to perfection for easy access. A possible flaw is that both the turrets are identical and there’s nothing to separate the two. Adjustments are at 1/8 MOA and the turrets have a loud responsive click when turned. When you peek through the scope, you will be amazed at how clear and bright the images look. I once compared it side by side with my Simmons 656245 Varmint series and there was absolutely no difference in the visual quality. Simmons cost approximately $100 more. There is no distortion whatsoever or any type of blurring on the sides. You’ll most likely be shooting in low light at dawn or closer to dusk. The 50mm objective lens clubbed with the multicoated glass increase light transmission into the lens giving you a clear picture. I have used the Barska 6.5-20×50 and hit targets at 175 yards with a single shot in near darkness. 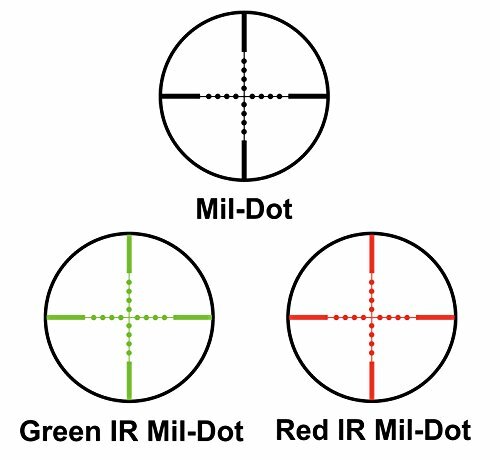 The mil-dot reticle has a really fine crosshair that allows you to see the target clearly even at long range. There are a lot of people who badmouth Barska scopes because they are made in China. I tend to differ. What isn’t these days? For me, Barska’s scopes are a reliable choice. You can read on our homepage how to find the best rifle scope for your needs. If you are considering more expensive scope, check our Vortex Diamondback review. I hope this clears the air about some of the suspicious Barska scope reviews that are floating around on the internet. A rifle that is also cheap and reliable like Barska scopes is the Marlin 60, you can check our scope recommendations for Marlin 60.